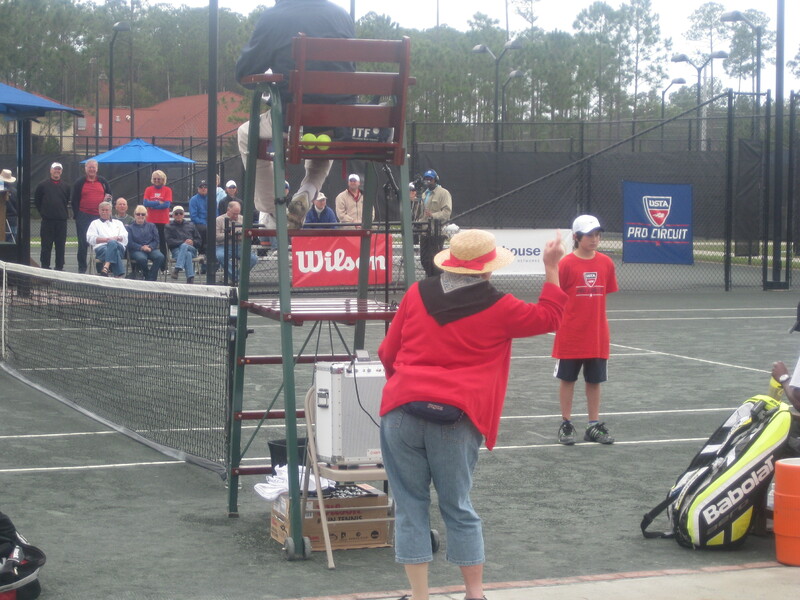 Sunday dawns almost as bleakly as I feel Nicola Ghedin’s prospects for victory are in his USA F4 singles final against Wayne Odesnik. It’s foggy, cloudy, and there’s a big, green blob of rain moving in on the doppler radar. 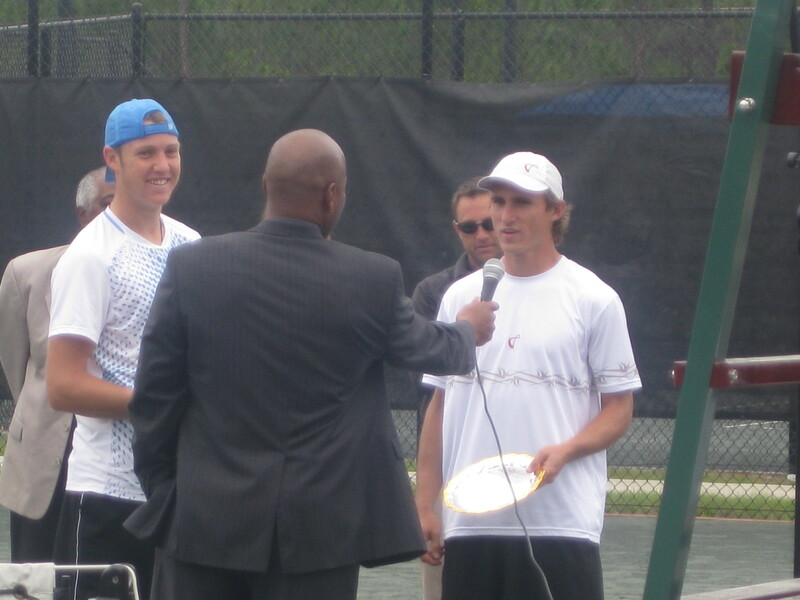 But before the singles final, we have the doubles championship to attend to (hopefully). 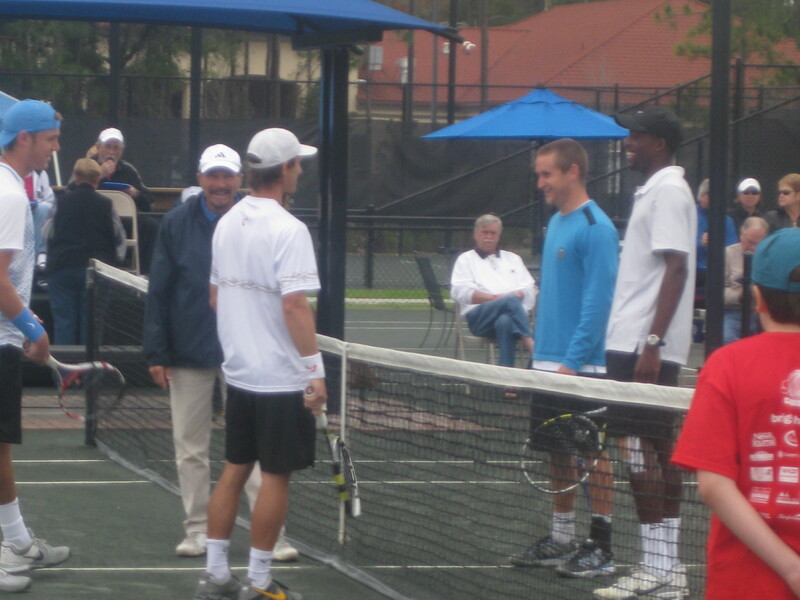 I arrive and make my way into the cozy Palm Coast clubhouse with two of the finalists, Jack Sock and Dimitar Kutrovsky, right behind me. “Fancy meeting you here,” I tell them, as I hold the door. They must be convinced I shadow them everywhere by now. 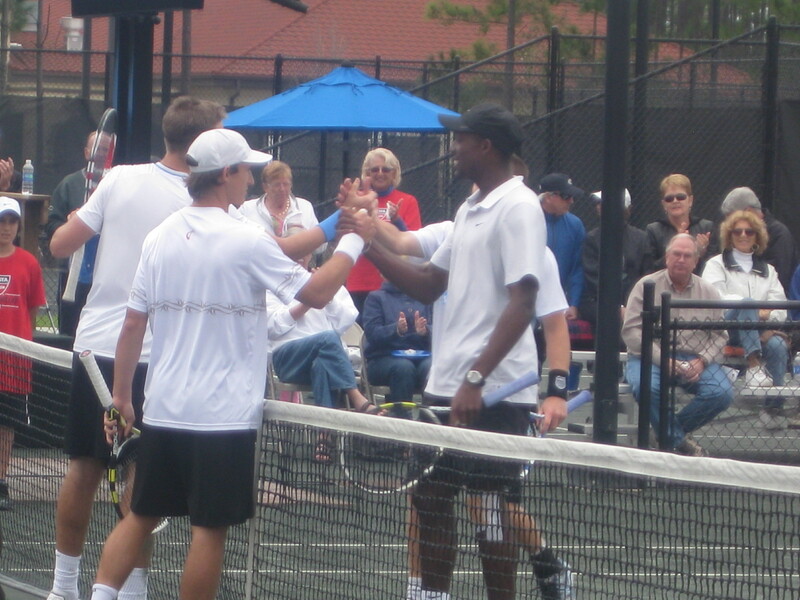 In a rare display of Futures seeding actually going to form, it’ll be top seeds Kutrovsky and Sock facing off today against the second seeded team of Greg Ouellette and Blake Strode. while Ouellette and Strode are making their first finals appearance together (although both have made pro finals with other partners). The weather holds, but Strode does not, broken in the first game on a nice low return from “The Tar” (Kutrovsky) that eventually sets up a well-Socked putaway. The top seeds get a second break in the seventh game, with Kutrovsky hitting a perfectly measured crosscourt lob to start the game and Jack nailing a forehand second serve return at Ouellette’s feet to end it. Sock is broken while trying to serve out the set, but then Sock/Kutrovsky break Strode to take the first set 6-3. The second seeds fight back, however, going up a break in the second. Sock double faults himself into a 0-30 hole serving at 2-4, but does well to extract himself and keep things close. 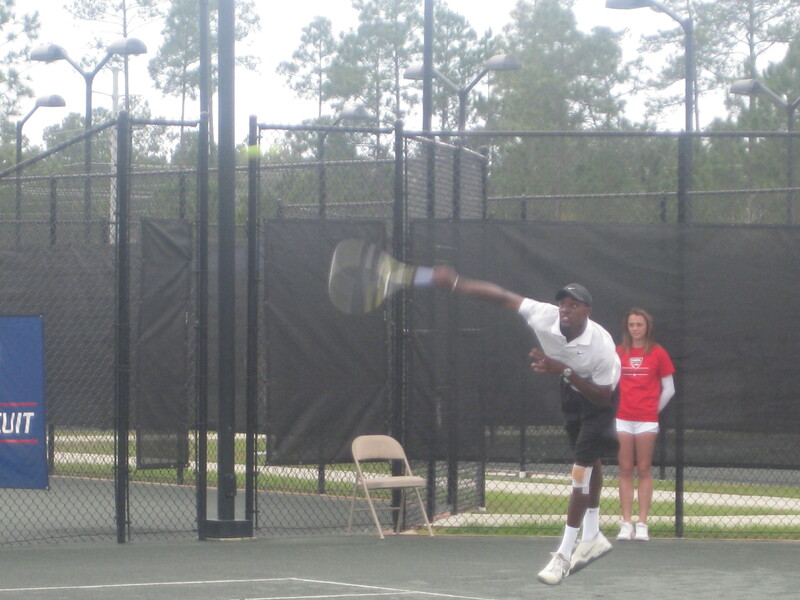 Strode, the Arkansas grad who’s deferred Harvard Law for a year to try his luck on the pro tennis tour, then takes command, holding to love then slicing an error-forcing return while his partner steps up with some super forehands and an absolutely perfect lob to break and take the second set 6-3. During the changes of ends, the woman who tends to the tunes (and the “PA system”) also manages to thoroughly entertain us with some spirited dance maneuvers. She’s hilarious, and her enthusiasm only adds to the great spirit in which this match is being played. Saturday begins a bittersweet weekend for me at Palm Coast, as it’ll be my last weekend covering live tennis for two weeks, until it’s time for ATP Delray. What the heck am I supposed to do with myself in the interim? Get a life? I dunno – sounds like a dicey proposition. Anyway, no worries about such weighty matters on this semifinal day, as the sun shines bright and the little amplifier under the ump’s chair pumps out the Jock Jams. The first semifinal of this day features the eighth seed with the nickname that will never catch on, Romanian “That’s So” Razvan Sabau against Italy’s Nicola Ghedin. 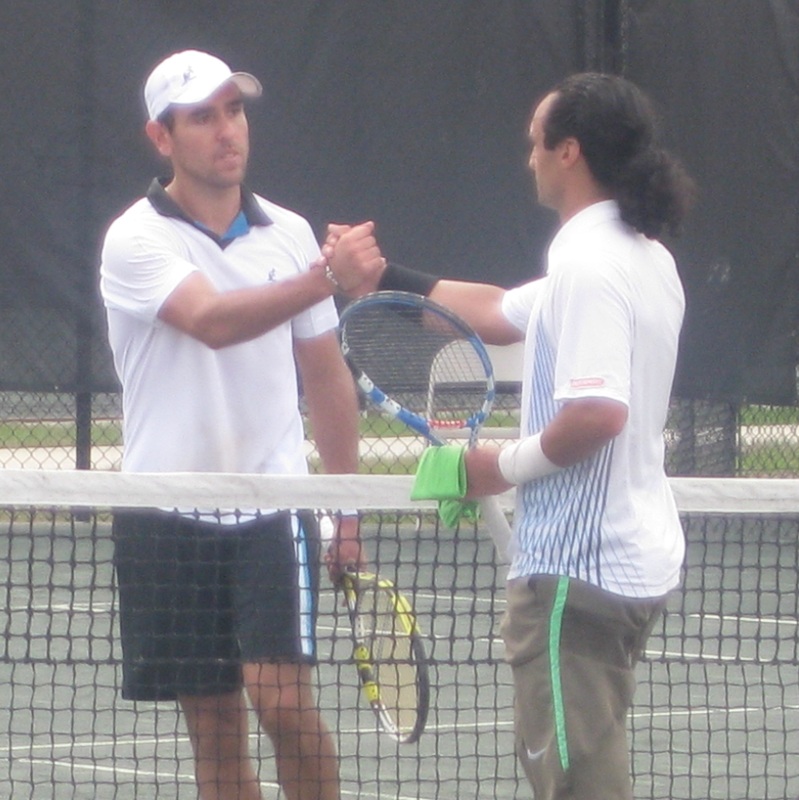 Six years ago, Sabau was the #74 player in the world, with wins over Janko Tipsarevic (2 of them, actually) (wins, not Jankos), Guillermo Coria (no word on the state of his serve at the time), and Sergey Demekhine, now the infamous coach of Vera Zvonareva. These days, Razvan is ranked #520 at age 33, with maybe a lost step and some evaporated vim but certainly with shotmaking skills still in tact. Meanwhile, the 22 year-old Ghedin comes in ranked #1,269 with a career high of 1,081, and it’s the first time he’s ever been to the semifinals at the pro level. His previous best result had been the quarterfinals of the 2009 Todi Challenger, where he lost 0-6 0-6 to Challenger Tennis Player To Watch David Goffin. 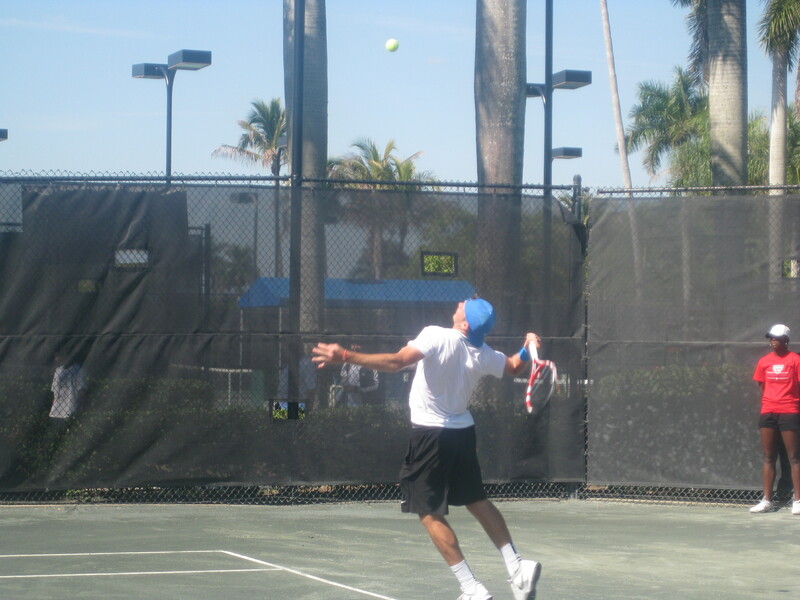 Friday begins as another lovely day for tennis in Palm Coast. And by “lovely” I mean gray, overcast and cold. “Pity us, people up north,” I devilishly tweet, hoping to stir things up amongst the disgruntled folk living north of the 31st parallel. It doesn’t work. The people of the twitosphere are remarkably good at not taking my infantile bait. Either that or they’re all too buried under snow and/or their fingers are too frostbitten to text me angry but concise messages. Anyway, it’s horrifically cold again. 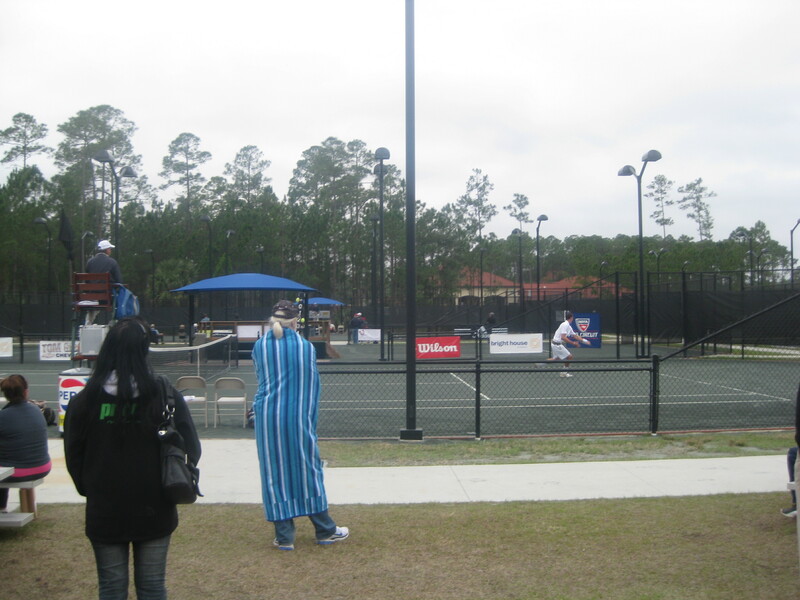 But we hearty folk in North Florida are undeterred, heroically playing tennis (or, even more heroically, watching it) despite the semi-frigid conditions. It’s quarterfinal day, and it’s thus time to play the quarterfinals. As sometimes happens on quarterfinal day. 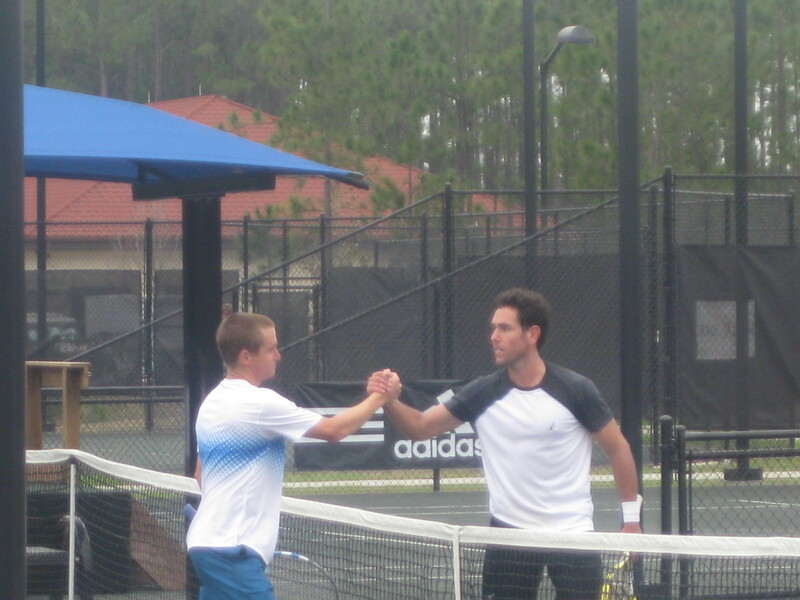 And as is nearly my sworn duty at this point, I begin by chronicling the progress of Jack Sock. 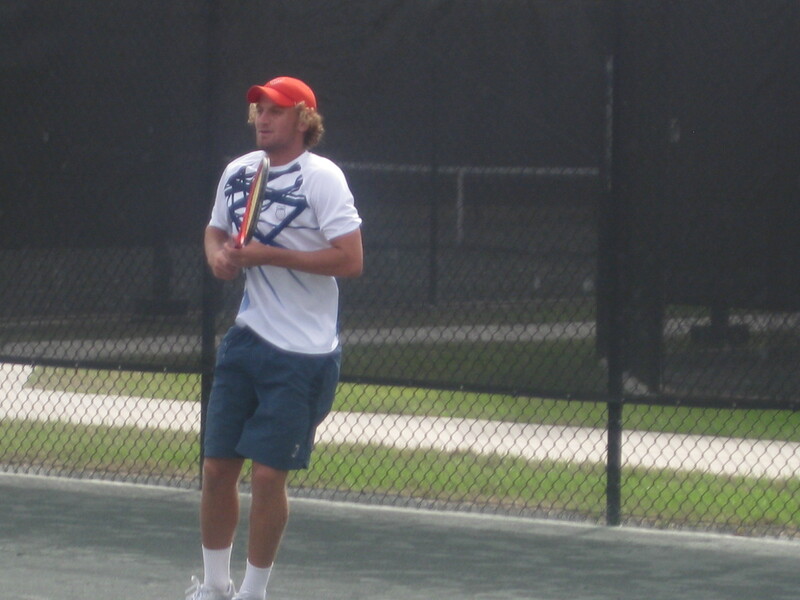 Today he plays the third seed, 20 year-old Aussie Matt Reid. Also playing concurrently are Andrea Collarini against the 8th seed, 33-year-old Romanian “That’s So” Razvan Sabau, as well as Italian Nicola Ghedin against Arkansas standout and Harvard Law deferrer Blake Strode. I don’t care how fair this is for the players – all this simultaneous action is hell on my spectating/reporting. How the heck am I supposed to keep careful track of three matches at once? Regardless, I try. It’s the least I can do for you, dear readers. Jack begins serving to Reid on Court 4, but they must’ve switched the net over from Court 3, because – as with the one during his comeback win over Soong-Jae Cho the day before – this mesh is messing with his shots, too; it carries a forehand wide at 30-40 in his first service game, and he’s broken just like that. 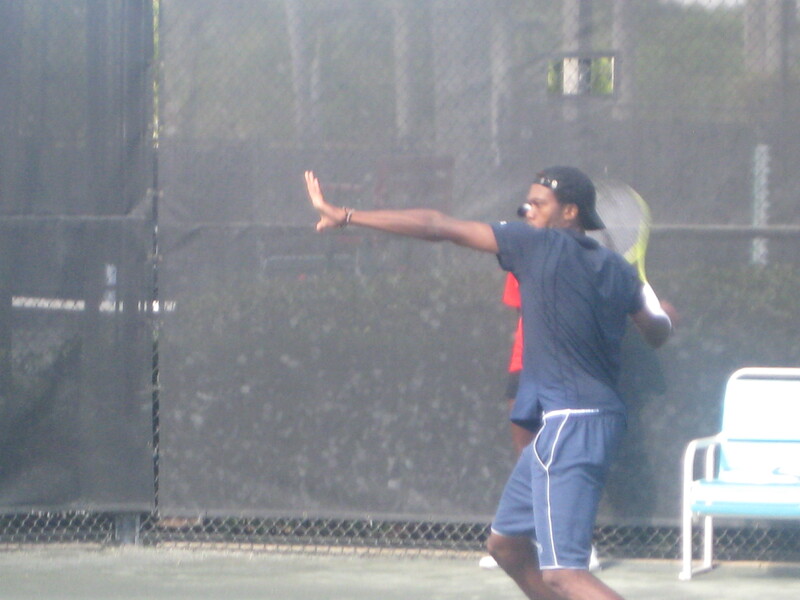 Though both guys struggle through some deuce holds, serves are held throughout . 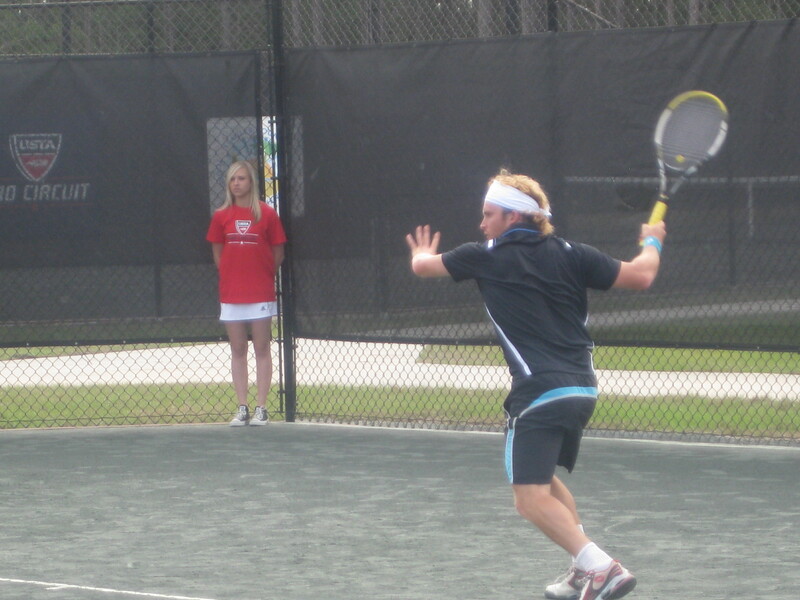 The scruffy blonde from Oz displays a potent forehand – biggest I’ve seen in the tournament – while Jack struggles at times with errors off the ground, even while throwing some winners in the mix. The points usually end with a Socked winner or error – by my incomplete tally (I was checking on other matches at times), Jack hits 4 forehand winners and 2 backhand winners in the first frame, but commits 5 forehand and 7 backhand unforced errors. He does try to press the issue a bit more, successfully venturing to net a number of times. But it’s the third seed Reid who displays better consistency in the opener, with almost as many winners but not nearly as many errors. His one break holds up, and he takes the first set 6-4. 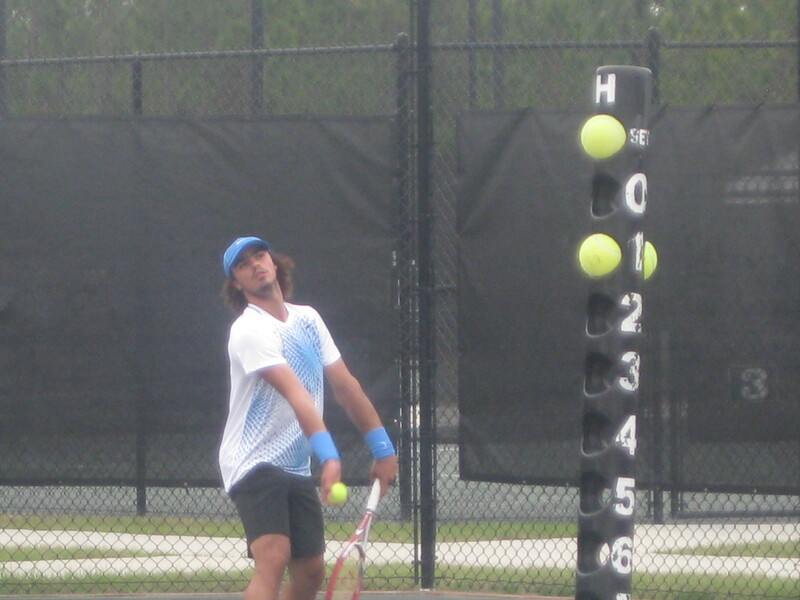 I duck out to check in on Collarini’s progress. 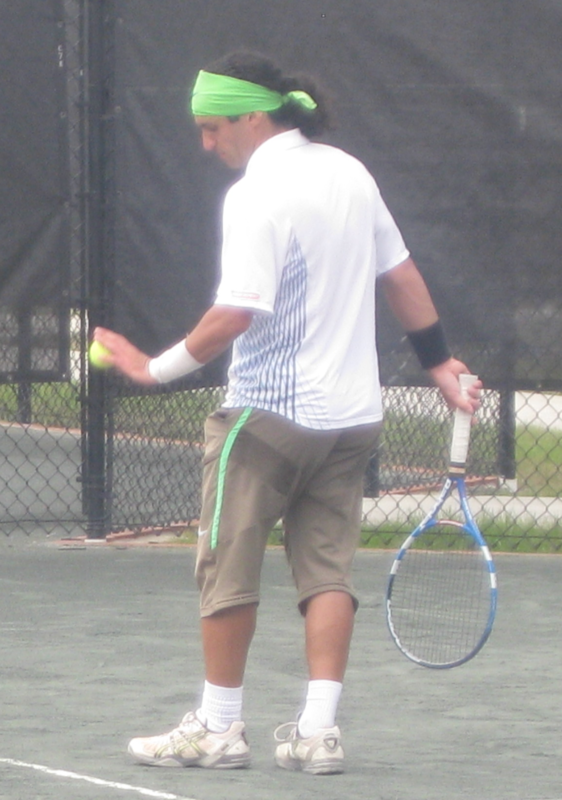 Or lack thereof, as I find him down two breaks, 2-5* to the 8th seeded Sabau, who to my eyes resembles Andy Kaufman’s character Latka from the old TV series, Taxi. Regardless, the Argentinian-American gets one break back with a backhand crosscourt winner, but then the Romanian breaks him right back to take the first set 6-3. I dart on over to see Ghedin serving for the set against Strode, which the Italian wraps up at love with a drop shot and a passing shot winner, 6-4. Back to Jack. I return to find Reid serving at 2-3 15-40 in the second. 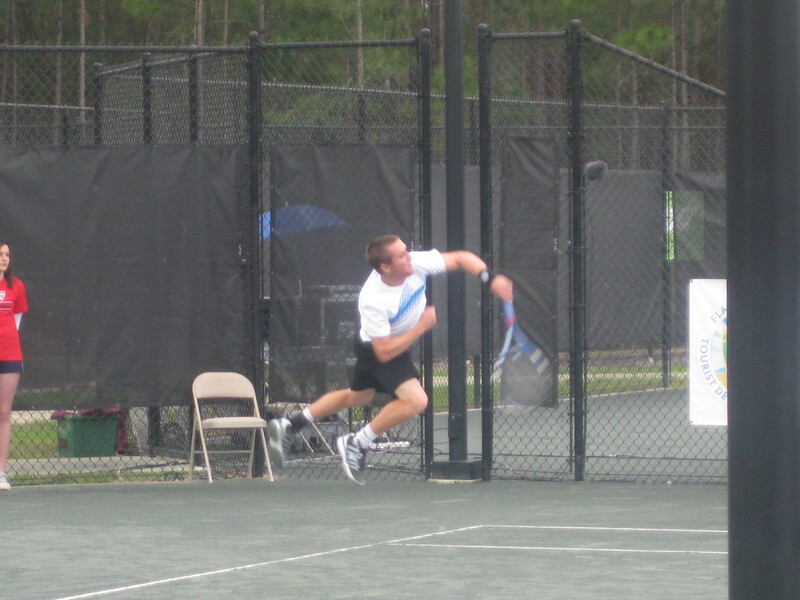 A Sock return hangs on the net and decides to stay on Jack’s side, negating the first break chance. But Jack gets a Reid on his opponent’s drop shot on the next point, sliding a forehand up the line that Matt badly botches for the break. Simply swinging, eh? Do you think they chose that show as a promotional 10K tennis tie-in? Probably not, huh? Doesn’t stop me from stopping to take a picture of it, though. And boy, you can really feel that four hours of northitude in the air. 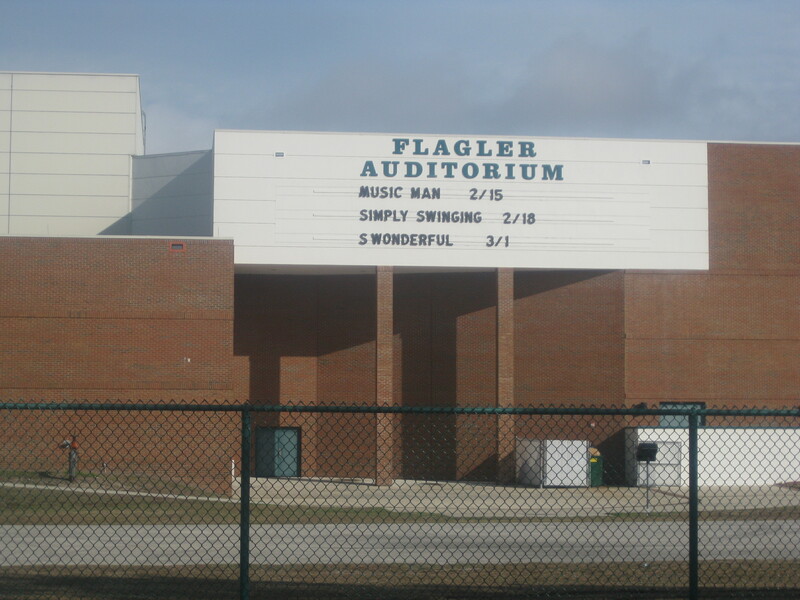 And yes, I know – if there’s one thing that really iced my cream when I lived up North, it was people in Florida complaining about “the cold” where there’s no snow to contend with, no sub-freezing temps, no arctic wind chill, etc. But on this Thursday, people are wearing full on winter jackets (as opposed to half-on winter jackets), and in some cases are wandering around in what look suspiciously like Snuggies. You’ll no doubt be happy to know I rated a “3”. What? Tennis? 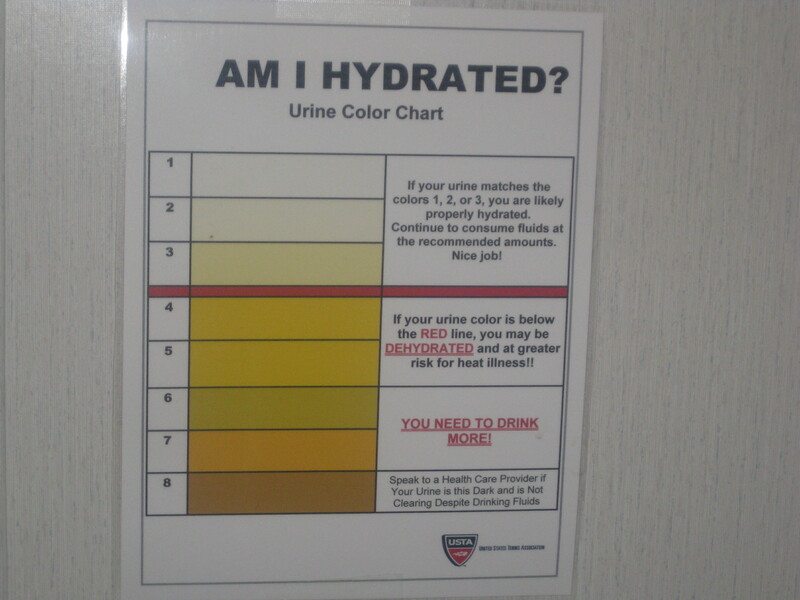 OK. Lots of that around the facility. And I had already missed a lot as well. The first rounds played out over Tuesday and Wednesday with a few very surprising results. 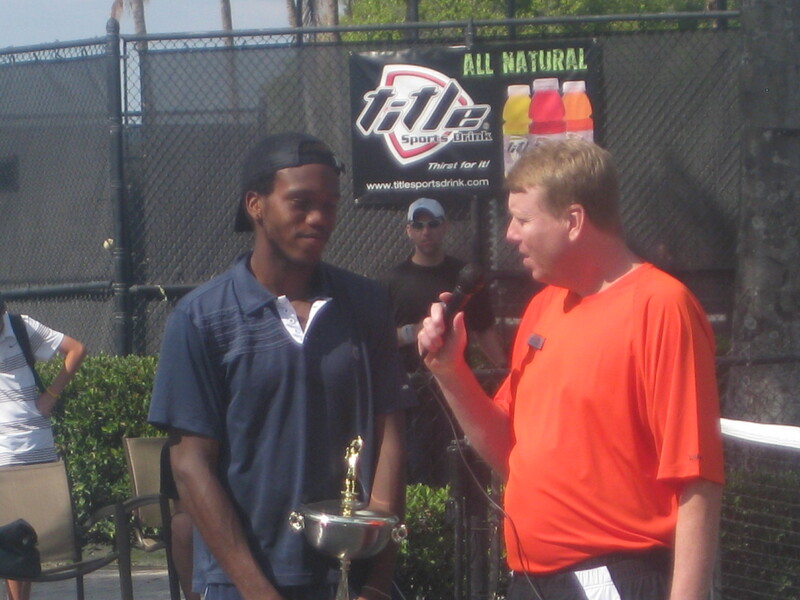 For one, USA F3 Weston champ Phillip Simmonds lost to 17-year-old Czech Jan Kuncik, ranked #1676 in the world, 6-3 7-6(6). Wowzers. 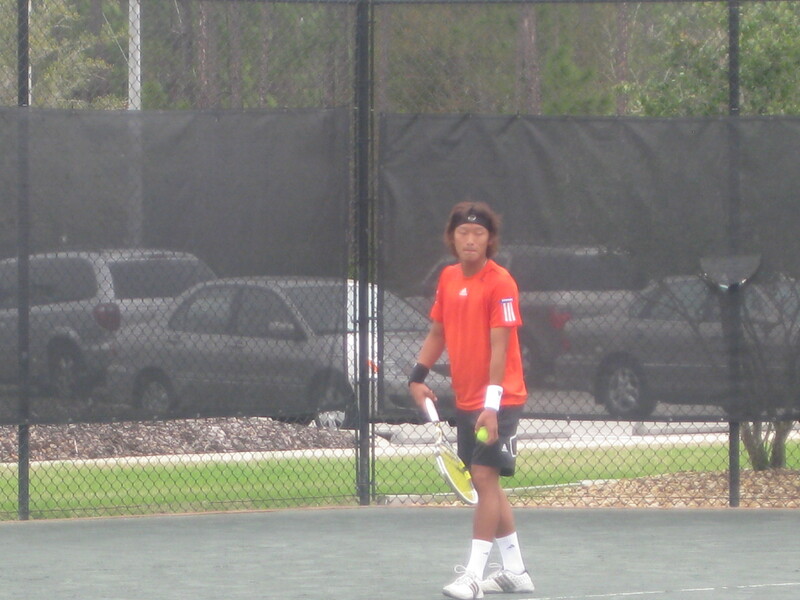 Seventh seed Denis Kudla also lost a tough one, 4-6 6-4 6-7(3) to F3 dubs champ Soong-Jae Cho. All in all, it was a terrible tourney for the seeded, as only three of the top eight players advanced into the second round – (3) Matt Reid, (8) Razvan Sabau and top-seed Greg Ouellette. It was the latter whose match I’m here to see first, as he’s paired up in a lefty battle against none other than Wayne Odesnik – making his comeback, of course, from a substance-related suspension. 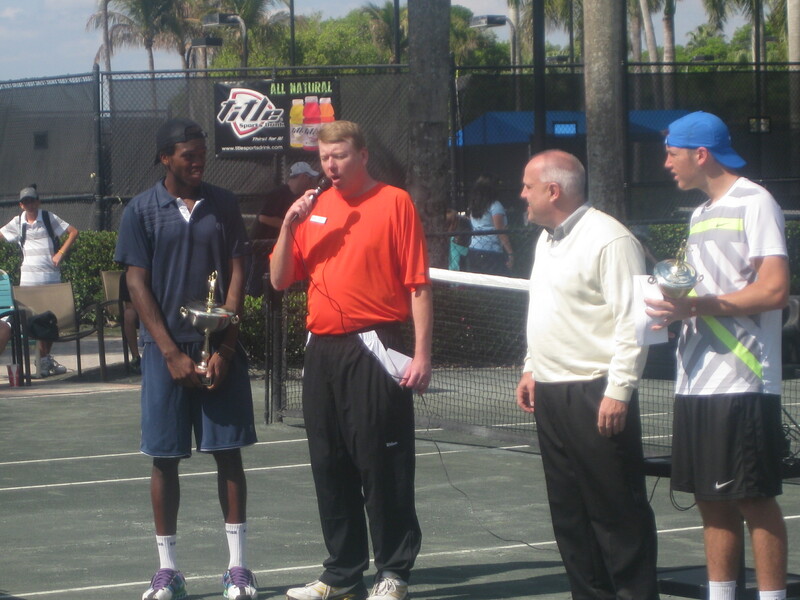 Wayne had lost one match to F1 eventual champion Luka Gregorc and had to retire against Nikko Madregallejo in Weston, but was otherwise undefeated on the year. I’m interested to hear how Wayne is received, and he gets a smattering of applause from the hearty assemblage of spectators. Ouellette, a bigger local fave, receives a much healthier hand for his intro, but Wayno doesn’t get shut out in that regard. On court, however, it seems he might. Get shut out, that is. Appearing very nervous, Wayne double faults thrice and gives up his initial service game, while Ouellette holds from 0-30 with two service winners and an ace wide. Down 2-0, Odesnik gets on the board when the top seed nets two backhands from 30-all, and then gets even as Ouellette makes four unforced groundstroke errors in the next game. Already there’ve been three over-fifteen-stroke rallies in the match. 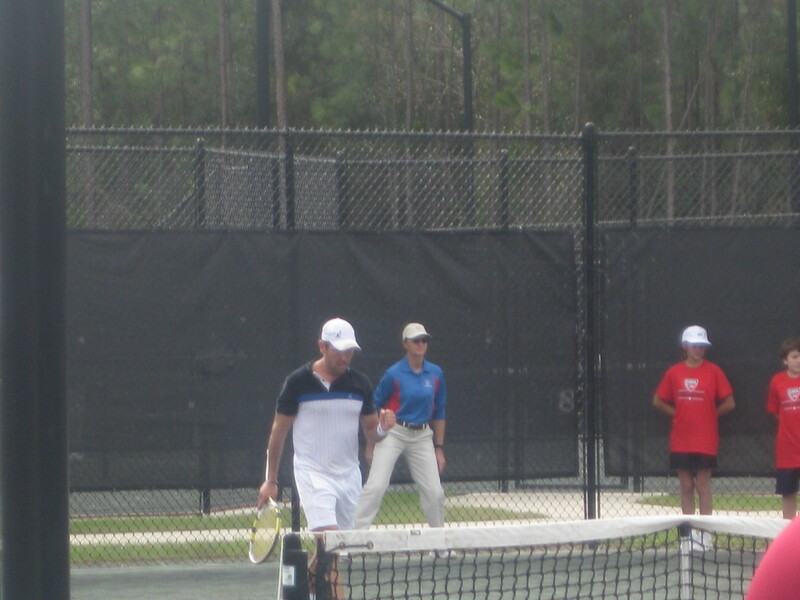 Greg gets it to deuce on Wayne’s service game at 2-all, but Odesnik is starting to settle in and rip the ball. He hits three outright forehand winners and forces two more errors off that wing to take his first lead of the set, 3-2* on serve. Ouellette is broken to 15 in the next game and gets a very strictly-enforced code violation for ball abuse – for whacking it into the net. Though Ouellette plays a nice game to break back to 3-4, he doesn’t win another in the match. 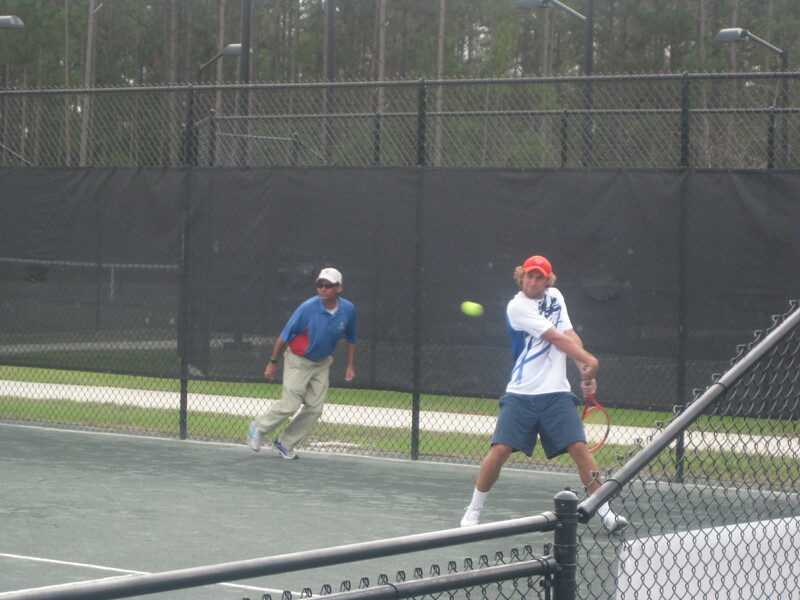 Odesnik is just in his own stratosphere, gamewise; it becomes quickly apparent that Ouellette can’t do anything to consistently trouble the 25 year-old, while Wayne is hitting the ball very deep, hard and heavy – it’s a level of tennis I’ve yet to see on the Florida clay these past few weeks, for all the good ball I’ve seen. Even acknowledging that Wayne was a Top 100 player, there was no guarantee that he’d come back match tough or be able to handle his nerve or be in this kind of form. I hear Jack Sock “C’mon!”ing in the distance, and – since I am now officially his shadow – that cry is kind of my bat signal in the sky to go check on the 18 year-old prodigy’s progress. He’s up against a guy who’s quickly becoming something of a nemesis – the very same Soong-Jae Cho who beat Kudla in the first round here also teamed up with Hyun-Joon Kim to beat Sock and his partner Dimitar Kutrovsky in the finals of F3 doubles. And those same two teams would be meeting for a rematch later on this very day. 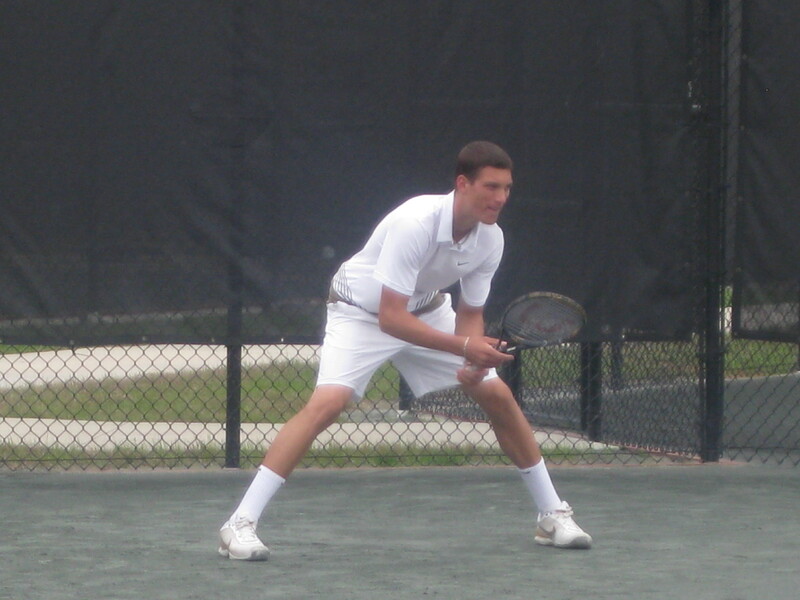 Semifinal day arrives quickly in Weston, and so does the end for the final seed left standing in the tournament, Benjamin Balleret. The fourth seed from Monaco wins the coin toss for his match against unseeded Jack Sock, but that’s about the only thing he wins on this day. Balleret, in the lime green highlighter shirt that seems all the rage of late, is not playing highlight reel stuff early – sluggish, lethargic and somewhat apathetic seeming. 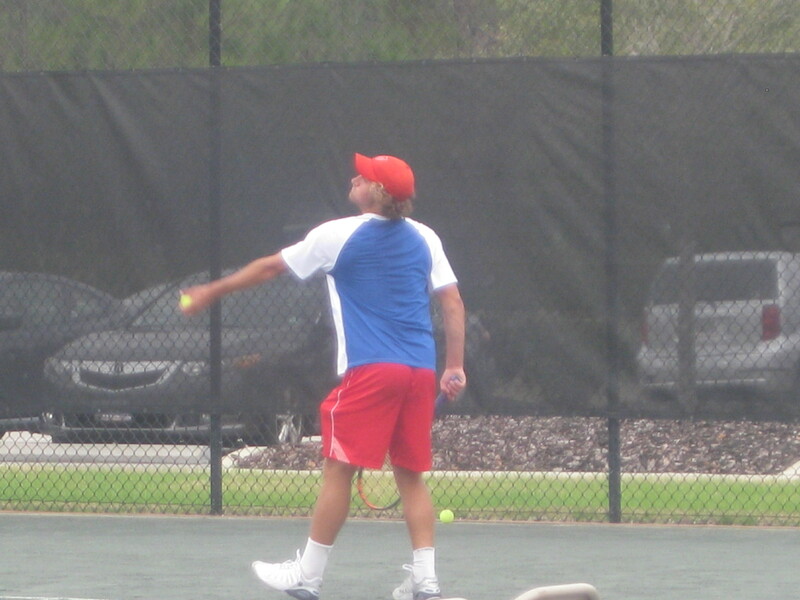 By contrast, Sock is slugging away, hitting the ball crisply, and the 18-year-old races to a 3-0 first set lead. In the 4th game, there are some balls Balleret hardly moves for, but he acquits himself from no man’s land with a half-volley forehand flick, and Jack obliges with a few groundstroke errors. Benji is on the tote board! Alas, two easy Ballererrors from 30-all in the next game help Sock maintain his break advantage. At 1-4, the 4th seed forehand volleys wide then throws in two backhand errors for variety. Jack breaks for a second time with a running, flat forehand crosscourt pass from deep in the court, then serves out the set despite losing the point on another cheeky tweener (which is the same term I use for flatulence, by the way). First set Sock, 6-1. I’ll spare you the grizzly details of the second set. Suffice it to say that, 2 minutes after I tweet, “Balleret must have a plane to catch. Something’s up with him – either injury or disinterest or both. 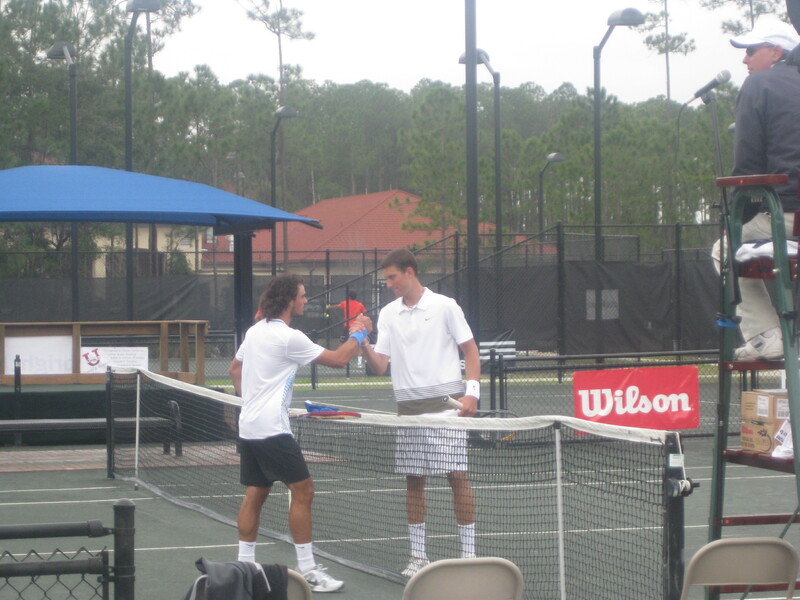 Playing so casually,” Balleret retires and Sock is through to the finals, 6-1 3-0 ret. 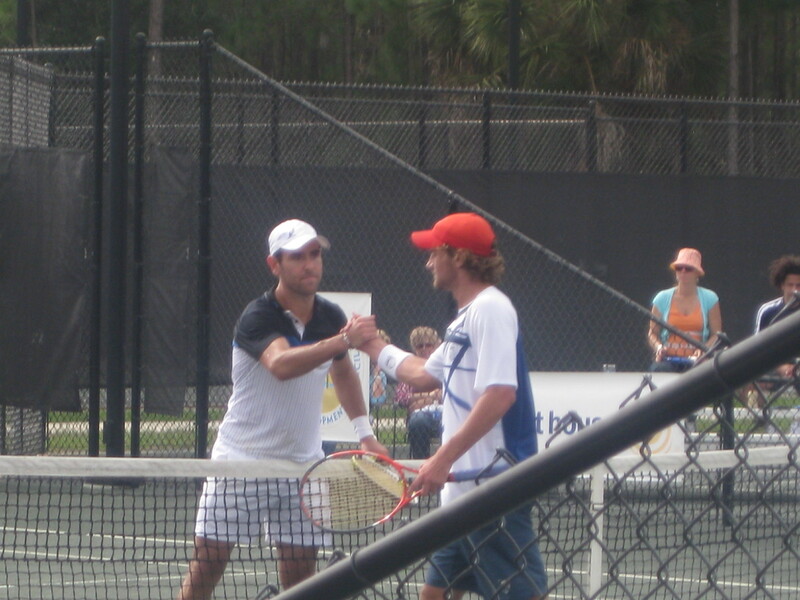 After the match, I ask Jack if he knew what was up with Balleret, but Benjamin didn’t tell him, I guess. I tell him he seemed sharp, even if he didn’t need to be. “I can only focus on the things I can control,” he says sagely. He’ll go far, that one. Certainly to the USA F3 finals. Possibly beyond.